Citrus is most notably known as the citron in history, with the cultivars of the sour orange, lemon, and sweet orange evolving through millennia. They are indigenous to the tropical southeastern Asia and Malay Archipelago, which is depicted in ancient manuscripts as far back as 2205 to 2197 B.C. Greek Philosopher Theophrastus called it the “Median apple” in his writings of about 310 B.C. as did Vergil, in Latin, between 70-19 B.C. Slowly, the citron made its way westward across 2 continents and thousands of years through trade and conquering cultures. The “Squeeze” on Florida’s Citrus History: Although citrus growers gradually migrated southward from central and northern regions after a series of freezes, Polk County remains the top citrus producer in the state. Eventually, citrus reached the Americas via Christopher Columbus’ second voyage to the island of Hispaniola (Haiti) in 1493, bringing only the finest agrarian supplies that would attest to the abundance of Spain and their priority for propagating the valued citrus seeds. This abundant display of wealth and conquest included the Spanish horse, which were magnificent warhorses, hardy lumbering cattle, and various citrus seeds of the citron (the sour and sweet orange, the lemon, and possibly lime, which were the luxurious fruits of kings and queens). 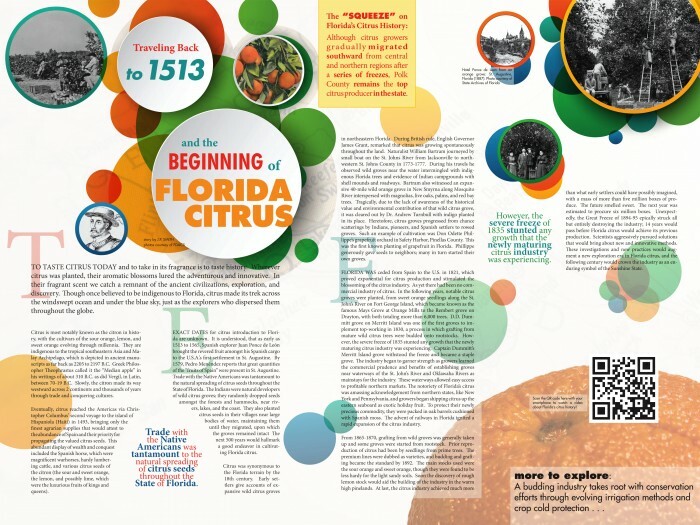 Exact dates for citrus introduction to Florida are unknown. It is understood, that as early as 1513 to 1565, Spanish explorer Juan Ponce de León brought the revered fruit amongst his Spanish cargo to the U.S.A.’s first settlement in St. Augustine. By 1579, Pedro Menéndez reports that great quantities of the “fruits of Spain” were present in St. Augustine. Trade with the Native Americans was tantamount to the natural spreading of citrus seeds throughout the State of Florida. The Indians were natural developers of wild citrus groves; they randomly dropped seeds amongst the forests and hammocks, near rivers, lakes, and the coast. They also planted citrus seeds in their villages near large bodies of water, maintaining them until they migrated, upon which the groves remained intact. The next 500 years would hallmark a good endeavor in cultivating Florida citrus. Citrus was synonymous to the Florida terrain by the 18th century. Early settlers give accounts of expansive wild citrus groves in northeastern Florida. During British rule, English Governor James Grant, remarked that citrus was growing spontaneously throughout the land. Naturalist William Bartram journeyed by small boat on the St. Johns River from Jacksonville to northwestern St. Johns County in 1773-1777. During his travels he observed wild groves near the water intermingled with indigenous Florida trees and evidence of Indian campgrounds with shell mounds and roadways. Bartram also witnessed an expansive 40-mile wild orange grove in New Smyrna along Mosquito River interspersed with magnolias, live oaks, palms, and red bay trees. Tragically, due to the lack of awareness of the historical value and environmental contribution of that wild citrus grove, it was cleared out by Dr. Andrew Turnbull with indigo planted in its place. Heretofore, citrus groves progressed from chance scatterings by Indians, pioneers, and Spanish settlers to rowed groves. Such an example of cultivation was Don Odette Phillippe’s grapefruit orchard in Safety Harbor, Pinellas County. This was the first known planting of grapefruit in Florida. Phillippe generously gave seeds to neighbors; many in turn started their own groves. Florida was ceded from Spain to the U.S. in 1821, which proved exponential for citrus production and stimulated the blossoming of the citrus industry. As yet there had been no commercial industry of citrus. In the following years, notable citrus groves were planted, from sweet orange seedlings along the St. John’s River on Fort George Island, which became known as the famous Mays Grove at Orange Mills to the Rembert grove on Drayton, with both totaling more than 6,000 trees. D.D. Dummitt grove on Merritt Island was one of the first groves to implement top-working in 1830, a process in which grafting from mature wild citrus trees were budded onto rootstocks. However, the severe freeze of 1835 stunted any growth that the newly maturing citrus industry was experiencing. Captain Dummitt’s Merritt Island grove withstood the freeze and became a staple grove. The industry began to garner strength as growers learned the commercial prudence and benefits of establishing groves near waterways of the St. John’s River and Oklawaha Rivers as mainstays for the industry. These waterways allowed easy access to profitable northern markets. The notoriety of Florida’s citrus was amassing acknowledgement from northern states, like New York and Pennsylvania, and growers began shipping citrus up the eastern seaboard as exotic holiday fruit. To protect their newly precious commodity, they were packed in oak barrels cushioned with Spanish moss. The advent of railways in Florida ignited a rapid expansion of the citrus industry. From 1865-1870, grafting from wild groves was generally taken up and some groves were started from rootstock. Prior reproduction of citrus had been by seedlings from prime trees. The premium lines were dubbed as varieties, and budding and grafting became the standard by 1892. The main stocks used were the sour orange and sweet orange, though they were found to be less hardy for the light sandy soils. Soon the discovery of rough lemon stock would aid the building of the industry in the warm high pinelands. At last, the citrus industry achieved much more than what early settlers could have possibly imagined, with a mass of more than five million boxes of produce. The future smelled sweet. The next year was estimated to procure six million boxes. Unexpectedly, the Great Freeze of 1894-95 epically struck all but entirely destroying the industry; 14 years would pass before Florida citrus would achieve its previous production. Scientists aggressively pursued solutions that would bring about new and innovative methods. These investigations and new practices would augment a new exploration era in Florida citrus, and the following century would crown the industry as an enduring symbol of the Sunshine State.